It’s been a tough start to the year for Asian stock markets — regardless of the disaster-driven tumult in Japan — with the trends that drove many of them higher last year turning against them. Have punters shifted stakes to the gaming tables? Last week’s news that China Gaoxian’s auditors have had difficulty verifying some of the company’s accounts takes the total number of China stocks listed here - or S-chips as they are popularly known - to have reported accounting or governance issues to three so far in 2011 and 10 since 2009. Given the worrying frequency of such unusual price and volume movements before the announcement of bad news in a number of recent cases, there is a significant risk that our supposedly robust regulatory regime governing insider trading will be called into question. The shares of another Singapore-listed Chinese firm have been suspended over concerns about its bank balances. 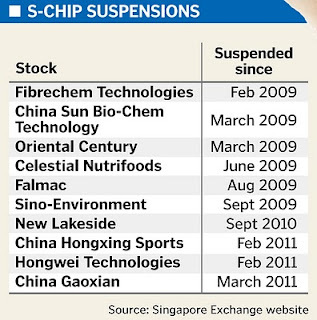 Amid rising concerns over recent accounting issues at S-chips, Singapore Exchange (SGX) has sent out reminders to audit committees (ACs) this week to implement proper controls to safeguard cash and other assets. Fears of a nuclear crisis in Japan hammered stock markets around the world yesterday, rapidly turning relative calmness the day before into full-blown panic. Chinese IPOs have long proven popular in New York, where investors desperate to diversify their holdings out of the moribund US economy queue up to grab a slice of the mainland’s rapid economic growth. The statement that Singapore does not have a capital gains tax is always followed by a string of caveats. Is it time to pull money from emerging markets or to pile back in? From the recent torrent of money fleeing the emerging markets, the first option would seem like a no-brainer, yet there are signs that the stampede might be reversing direction. So the best way to approach the market? Take a backseat for a while and observe. Diligence in picking stocks with sound fundamentals and patience could perhaps be key to capital upside in the year to come. 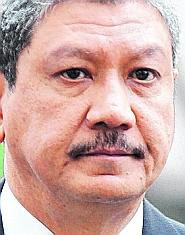 In the harshest sentence ever meted out to an independent director for making a false and misleading statement in Singapore, Airocean’s former independent director Peter Madhavan was yesterday sentenced to four months’ jail. All the recent debate surrounding the trading suspensions of China stocks Hongwei Technologies and China Hongxing and how best to accommodate the interests of small shareholders should not divert attention from an equally important point raised by a BT reader earlier this week: the need to investigate the sharp price falls suffered by both counters in the run-up to their suspensions. China Forestry Holdings says its former chief executive, Li Hanchun, was arrested last week in Guizhou province for allegedly embezzling 30 million yuan (HK$35.5 million). Should small investors be left holding the proverbial baby for a seeming eternity when a company’s stock is suspended following the discovery of some irregularities? US regulators are investigating Las Vegas Sands Corp (LVS), the parent of Marina Bay Sands (MBS), for its Macau operations’ compliance with the US Foreign Corrupt Practices Act, the company disclosed in an annual report. Last week’s collapse in the shares of popular commodities stock Olam International was widely attributed to a ‘sell’ issued by a foreign broker, with the issuing analyst then coming under fire for allegedly not being wholly familiar with the complexities of Olam’s business and accounting practices.